Folding Aluminum Laptop Stand W/ Swivel Base. This lightweight and cleverly designed notebook stand folds down very flat--only 1/2" thick--so it packs easily in many laptop bags. Select one of six angles of raise just by adjusting the hinged aluminum plates. 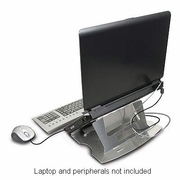 A slim swivel base allows you to easily rotate your computer. Includes travel bag. Sturdy, stable and durable design. • Suitable for any laptop: up to 17" wide screen laptops and laptops with curved front ends. • Anti-theft protection: use the support hole for looping the cable of a laptop lock. • Dual purpose protective covering: protect the front of the holder during transport and the desk while in use. • Ultra-thin: with just 4.2 mm it's the most portable laptop holder in the world.